Was Charles Darwin Responsible for Adolf Hitler and the Columbine Killings? To see the hysterical fear of Darwinian science, go here. James Kennedy of the Coral Ridge Presbyterian Church has produced a television documentary entitled "Darwin's Deadly Legacy," which was shown on television stations across the United States over the past weekend. He has interviews with many of the leading proponents of creationism and intelligent design theory and critics of Darwinism, including Michael Behe, Ann Coulter, Ken Ham, Phillip Johnson, Carson Holloway, and Richard Weikart. The documentary claims that Darwin was responsible for Adolf Hitler and for the killings at Columbine High School in 1999. The reasoning is that Darwin rejected all morality in teaching "survival of the fittest" in which the strong would destroy the weak. Hitler put this teaching into practice in his eugenics, his racism, and his anti-Semitism. The high school boys who killed 12 people and themselves at Columbine High School were also motivated by their belief in Darwinian science. One of them left a message on his website: "You know what I love? Natural selection! It's the best thing that ever happened to the Earth. Getting rid of all the stupid organisms." Darwin's responsibility for all this is supported by the interviews. 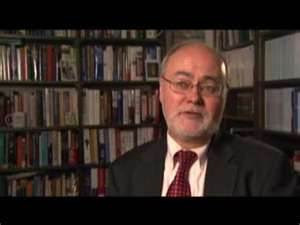 Richard Weikart repeats the claim of his book FROM DARWIN TO HITLER that Hitler adopted Darwin's science. Ann Coulter says that Weikart's book opened her eyes to this ugly fact. And Carson Holloway speaks about how Darwin's science subverted traditional morality. I have posted responses to Weikart, Coulter, and Holloway. I have pointed out that Darwin defended morality as rooted in a natural moral sense, and that he looked to the Golden Rule as the highest expression of this morality. Of course, none of this is mentioned by anyone in this documentary. It is very disturbing that the people interviewed for this documentary would support such a crude and vulgar piece of propaganda. Many conservatives who object to Darwinian conservatism seem to be open to a biological conservatism that does not assume the truth of Darwinian evolution. I wonder whether this might offer a ground of compromise. Although the proponents of intelligent design object to evolutionary explanations of the distant causes of human biological nature, they do not seem to object to biological explanations based on more proximate causes. To find common ground among conservatives for accepting a biologically rooted natural law, we could set aside the arguments from evolutionary biology and rely only on arguments from behavioral biology. Even if we cannot agree on the evolutionary causes of human nature, we might still agree on the proximate causes of human behavioral biology. Evolutionary causes are difficult to judge because they often are not directly observable, and we have to infer evolutionary history from indirect evidence (such as the fossil record). By contrast, proximate causes are often open to direct observation. For example, we can measure fluctuations in hormonal levels and correlate that with behavioral changes. So, for instance, we might get general agreement among most conservatives that the human propensities to sexual differences, sexual mating, familial bonding, and parental care are rooted in human biological nature, and this challenges the radical feminist's quest to establish androgynous behavior as the norm for human beings. Such propensities of human biology are directly observable. For example, we might study the differences in male and female brains that support differences in male and female behavior. Some of us would see this as a product of Darwinian evolution. But others would see it as the work of the intelligent designer. And yet we could agree on the observable proximate causes of human sexual biology. Conservatives such as Harvey Mansfield, Peter Lawler, Carson Holloway, and John West all seem to agree with me that there are natural norms for human conduct rooted in human biological nature, even as they disagree with me about the evolutionary causes of this biological nature. Holloway can accept the fact of evolution by natural selection. He even asserts that "religious believers can accept that the physical and even the emotional and moral constitution of human beings has been shaped by natural selection." But where Holloway departs from my Darwinian conservatism is that he believes morality cannot be secure if it is not founded on a "religiously-informed cosmic teleology." So while Holloway might accept the Darwinian account of human evolution as true, he would want to see this evolutionary history as guided by a divine intelligence directing it to some cosmic purpose. In fact, theistic evolutionists believe that Darwinian evolution is compatible with a religious belief in God as the ultimate source of evolutionary order. Those like John West won't concede this much to Darwinian science. They insist that the intelligent designer could not, or would not, employ evolutionary mechanisms to execute his divine purpose. But even West would say that the observable biological nature of human beings supports a biologically grounded natural law in which natural human desires become normative because they manifest the moral will of God. In a way, Holloway and West fundamentally agree with me. We all agree in that we are biological conservatives, because we believe that human biological nature supports conservative principles such as traditional morality, family life, property, and limited government. We disagree, however, about the Darwinian basis of biology. My biology is completely Darwinian. Holloway's biology is partially Darwinian. West's biology is completely anti-Darwinian. I argue that for a biologically based conservative morality, Darwinian biology is sufficient in providing an immanent teleology. But Holloway and West argue that this is not sufficient. No healthy morality can survive, they believe, without a religiously-grounded cosmic teleology. Holloway provides that cosmic teleology by adopting the position of theisitic evolution. West provides that cosmic teleology by adopting the position of intelligent design theory that denies Darwinian evolution completely. Some of this might come up at the APSA panel in Philadelphia with me, Holloway, and West as participants. The National Center for Science Education is the leading organization in the United States that defends the teaching of evolution in public school biology classes against creationists and proponents of intelligent design. I agree with the NCSE position that the evidence and arguments for the theory of evolution support this as strongly as any theory in science. I also agree that both young-earth creationism and intelligent design theory lack the support that would justify treating them as a plausible scientific theory. I disagree with NCSE, however, in that I see nothing wrong with allowing students to study this debate and decide for themselves whether the weight of the evidence and arguments favor evolution over creationism and intelligent design. Although I believe that evolution can be compatible with religious belief, because it is quite reasonable to be a theistic evolutionist, I understand that some people who interpret the Genesis story of creation as a literal six-day creation cannot accept Darwinian evolution. So why shouldn't students with creationist beliefs be permitted to at least discuss this in a biology class? After all, Darwin himself framed his theory as an alternative to the theory of "special creation." So if students were reading Darwin, they could examine his reasoning and consider the implications for biblical religion. The folks at NCSE are horrorified by my proposal. They insist that both creationism and intelligent design are positions of religious faith that have no place in a science class, because we need to keep religion and science clearly separated. But in taking this position, NCSE has to employ an evasive rhetoric. On the one hand, they insist that the Darwinian theory of evolution is not contrary to religious faith. On the other hand, they implicitly concede that the theory of evolution really does deny some kinds of religious faith--such as the biblical literalist faith in a six-day creation. This evasive rhetoric can be seen in the latest "evolution education update" at the NCSE website. They quote from Lawrence Krauss's New York Times op-ed column about the recent state school board elections in Kansas. According to Krauss, "the battle is not against faith, but against ignorance." Teaching the truth of evolution is simply a matter of overcoming ignorance, and this does not deny religious faith at all. But then in the story about the SCIENCE magazine article about "the public acceptance of evolution," it is noted that a substantial portion of the American public does not accept the idea that human beings developed from other animal species. The explanation for this is that they believe in a literal six-day creation by God, in which God created human beings separately. But here it is clear that there really is a conflict between the creationist faith and the theory of evolution. Biblical literalists cannot believe in human evolution by natural means from other animal species without denying their version of biblical faith. So here, contrary to the rhetoric of NCSE, the battle is against faith, not just ignorance. The fundamental problem is the naive assumption that science and religion can be kept absolutely separated. It seems clear to me that while Darwinian science is compatible with some kinds of religious belief, it denies a biblical literalist belief in special creation. To refuse to face up to this problem in the biology classroom is dishonest and evasive. We should all know what's wrong with higher education today. Teaching and research have become so specialized, fragmented, and incoherent that we cannot see that unity of knowledge necessary for sustaining general or liberal education. To renew the tradition of the liberal arts, we need a new unifying framework of thought. As far as I can tell, there is today only one plausible source for such a common ground of knowledge, and that is Darwinian evolutionary biology. I began to move towards this conclusion as an undergraduate student at the University of Dallas in the late 1960s. My youthful excitement about philosophy was stirred by Aristotle's declaration that all human beings by nature desire to understand, a desire tht leads natural philosophers to search for the ultimate causes or reasons for all things. Fascinated by Aristotle's comprehensive investigation of nature and human nature, I noticed that much of his writing was in biology, and that even his moral and political works assumed a biological understanding of human nature. So I wondered whether Aristotle's biological naturalism could be compatible somehow with modern Darwinian biology, and whether this might support a general study of human life within the natural causal order of the whole. The aim of liberal education is to use all the intellectual disciplines to probe how the complex interaction of natural human propensities, cultural traditions, and individual choices shapes the course of human experience within the natural world. Darwinian theory provides a general conceptual framework for such liberal learning grounded in the scientific study of genetic evolution, cultural evolution, and cognitive judgement. This Darwinian view of liberal education has guided my teaching. At Northern Illinois University, I helped to organize "Politics and the Life Sciences" as a field of study at both the undergraduate and graduate levels in the Department of Political Science. Some of the courses in the program are cross-listed as biology courses. So my undergraduate courses typically enroll a large number of students majoring in biology along with others majoring in the social sciences and humanities. My graduate students apply Darwinian reasoning to issues in political philosophy and other areas of political science. All the students see how liberal learning at its best brings together ideas and methods from all the intellectual disciplines to illuminate the deepest questions of human life and its position in the universe. At the core of my thinking is the idea of human nature. In today's academic world, it is common for postmodernist relativists to assert tht liberal education cannot be directed to the study of human nature, because the idea of human nature is an arbitrary social construction. But I believe that there really is a universal human nature that is constituted by at least twenty natural desires that manifest themselves throughout history in every human society, because these desires belong to the evolved nature of the human species. These natural desires direct human behavior into regular patterns. Men and women will marry and form families. Mothers will care for their children. Young males will compete for mates and status. Societies will organize themselves as male dominance hierarchies. Competing societies will go to war. And human beings will use language and other symbols to try to figure out what it all means. A broader model of this kind of Darwinian liberal education is David Sloan Wilson's Evolutionary Studies Program (EvoS) at Binghamton University. The website for the program can be found here. This is an integrated curriculum with a required introductory course "Evolution for Everyone" and a list of courses across the university from which students must earn a minimum number of credits. Wilson teaches "Evolution for Everyone" as the course in which all students are introduced to the central concepts of evolutionary theory as well as some illustrative application of those concepts to various fields of study. He emphasizes the application of evolutionary ideas to human nature. Over 50 faculty members representing 15 departments are involved in the program. As a result, both faculty and students from across the university in many different departments are brought together with Darwinian reasoning as their common language to talk about questions of human nature and the natural world. I hope to help organize a similar program at NIU. In the fall of 2007, I will be team-teaching a course on evolution with a philosopher and a biologist. We then will try to build an evolutionary studies program around this course. Through such a Darwinian liberal education, we might renew the quest that began with Aristotle to satisfy our natural desire to understand the causes or reasons of all things. Carson Holloway's book The Right Darwin? is a general criticism of any attempt to ground morality in human biological nature. His main idea is that there can be no morality without religious belief, and therefore any purely natural morality rooted in natural desires cannot work, because the natural desires are both moral and immoral. In particular, he criticizes my defense of Darwinian morality. On January 9th, I posted a response on this blog to Holloway's book. Recently, he wrote a brief summary of his book's argument for Science and Theology News, which can be found here. He implies that a Darwinian view of morality rejects religion as a source of moral instruction. This is not true, because as I have said on various occasions, Darwin emphasizes the importance of religious traditions as a source of moral principles. But insofar as morality is natural for human beings, morality can stand on its own natural ground even without religious belief. By contrast, Holloway insists that morality is impossible without religious belief. So it would seem that, for Holloway, atheists or those who don't have the right kind of religious beliefs cannot be moral. I disagree. In this commentary, as in his book, Holloway is vague about what he means by "religion" and about exactly how religion supports morality. The only specific example he provides in his commentary is the moral debate over slavery. Darwin was a vigorous opponent of slavery. And I have argued that the human moral resistance to slavery was rooted in a natural human resistance to exploitation. Holloway suggests that this natural resistance is not enough without a religious ground for opposing slavery. Holloway does not explain how exactly religion condemns slavery. He says nothing about the debate in the United States over the Biblical basis of slavery. The debate was so intense that some of the major Protestant denominations--such as the Baptists and Methodists--were split into northern and southern schisms, because southern Christians thought the Bible supported slavery, while northern Christians thought slavery was contrary to the Bible. Slavery is never clearly condemned in the Bible. On the contrary, there are many passages that seemingly endorse slavery. Some recent books--such as Eugene Genovese's The Mind of the Master Class and Mark Noll's The Civil War as a Theological Crisis--have surveyed the Biblical arguments for slavery in the American South before the Civil War. What would Holloway say about this? Would he say that the proslavery Christians misinterpreted the Bible? But where then does the Bible clearly condemn slavery? Does he really want to say that without the Bible it would be impossible to recognize the immorality of slavery? This illustrates the implausibility of Holloway's argument. He assumes that religious texts such as the Bible provide a clear, reliable, and authoritative set of moral teachings that cannot be known by natural human experience. But it's hard to see how we could rely on the Bible for moral instruction if we could not pass it through that natural moral sense that Darwin saw as rooted in our evolved human nature. Do the Bible and the Koran Support Theocracy? In his prophetic essay from 1990, Bernard Lewis warned that Islamic fundamentalism would bring a "clash of civilizations" with radical Islamists promoting theocracy and attacking the Western tradition of religious liberty and toleration. In this essay, Lewis argued that Islam did not share the Christian tradition of separating Church and State, a tradition based on the New Testament teaching about rendering to Caesar the things that are Caesar's and rendering to God the things that are God's (Matthew 22:20-22). Conservatives generally accept this principle of separating Church and State and support the idea that a free government of limited powers will leave people free to exercise religious liberty without enforcing any particular religious beliefs by law. But some Christian conservatives now reject the idea of Church/State separation as a "myth." And some--like the "Christian Reconstructionists"--want to establish a theocracy based on the Mosaic laws of the Old Testament. Recently, there have been a half-dozen books warning that the Christian Right promotes theocracy. Richard John Neuhaus and others at the journal First Things dismiss this fear of Christian theocracy as ridiculous. (An example can be found here.) But Damon Linker, a former editor at First Things claims in a recent article that Neuhaus's vision of a Catholic Chrisian America really is theocratic. Some Christian conservatives are suspicious of the idea of religious liberty and toleration because they fear that it promotes atheism. They suspect that the philosophic defenders of toleration--like John Locke--were secretly engaged in an atheistic attack on Christianity. But I would argue that Lewis is right in suggesting that the idea of religious liberty really is rooted in the New Testament, and therefore Christians should support it. I have come to this conclusion after spending the past academic year teaching a series of three graduate seminars on the political teaching of the Old Testament, the New Testament, and the Koran. From these studies, I have been persuaded that Roger Williams was right in reading the New Testament as teaching that Christians must defend religious liberty and reject theocracy or any governmental supervision of religion. Williams was expelled from the Massachusetts Bay Colony in the 17th century for making this argument. In 1644, he published The Bloody Tenent of Persecution, in which he laid out his theological arguments for religious liberty as rooted in Christian doctrine. He established the colony of Rhode Island as a place where such religious liberty would be secured. Williams rightly recognizes that the Old Testament is theocratic, because the Mosaic law enforced religious belief and practice by coercion. But he points out that the New Testament sets aside Mosaic theocracy by declaring that the spiritual salvation of Christians does not depend upon assuming earthly political power. The New Testament never presents the Christians as using political power to enforce Christian doctrine. Rather, the Christian churches enforced their beliefs on their members and expelled those that refused to obey, but they never used legal coercion. As only one example of how the doctrine of religious liberty enters the New Testament, consider Paul's First Letter to the Corinthians. He advises the Corinthians to enforce their Christian morality within the assembly of believers, but without trying to coerce those outside the church. "For what is it for me to judge those outside? Is it not for you to judge those inside? But God is to judge those outside" (I Cor 5:12-13). Consider the difference between the Old Testament and the New Testament in handling homosexuality. The Old Testament prescribes that homosexuals must be killed (Lev. 20:13). The New Testament condemns homosexuality but does not order that they be killed (Romans 1:26-27). The New Testament Christians have no desire to use the legal and political power of the state to enforce their religious prescriptions against homosexuality. By contrast, the Christian Reconstructionists want to restore the Mosaic law for stoning homosexuals to death. Williams rightly reads the New Testament as separating civil authority and spiritual authority. All citizens, regardless of their religious beliefs, are subject to the civil authority of the state to enforce a peaceful social order (as indicated by Romans 13:1-7). But the spiritual authority of God over the believer is a matter of individual conscience that cannot properly be dictated by the legal power of the state (as it was in the Mosaic regime of the Old Testament). Christian conservatives should look to Williams as providing a Christian understanding of religious liberty based on a strict separation of Church and State. So what about the Koran? It's ambiguous on this issue. It declares that "there is to be no compulsion in religion" (2:256). And some Muslims see this as Koranic authority for religious liberty and toleration. Some argue for "minding one's own business," and they cite the Koranic verse that says: "O you who believe! Guard your own souls: If you follow right guidance, no hurt can come to you from those who stray" (5:108). But the Koran also speaks of the unquestionable authority of the Prophet in a manner that can be read as suggesting the rule of the Caliphate--the merging of political and religious authority (2:30, 4:59, 4:80, 38:26). And, of course, Muhammad--unlike Jesus--combined military and political power with religious authority. The most disturbing part of the Koran to me is that the Old Testament stories are altered to remove any indication of the immoral weaknesses of those who ruled over the people of Israel. For example, the Koran speaks of King David without ever speaking about his commiting adultery and murder in the service of his sexual lust for Bathsheba. The Koran repeatedly denounces the people of Israel for their sinfulness, while praising their leaders as morally perfect (27:15-44, 38:26-40). This denies the fundamental premise of limited government--that human beings are too limited in their virtue to be trusted with absolute power. The Old Testament supports limited government by depicting the rulers of Israel as having all the moral defects of power-seeking men. The warnings about the despotic character of kingship (I Samuel 8) have often been quoted by the critics of monarchy. The Old Testament fails, however, to see that imperfect human beings are not to be trusted with political power over the religious beliefs of the citizens.